Play is a pleasurable, amusing interaction with people, animals, or toys, often in the context of learning or recreation that elevates our spirits and brightens our outlook on life. It develops self-expression, self-knowledge, self-actualization, and self-efficacy. 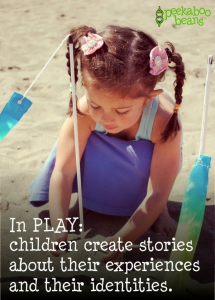 Play inspires creative thinking and discovery and boosts our self-confidence. Play can be used to rehearse life events considered necessary for survival. Play Therapy works under the assumption that through imagination and forms of creative expression, diagnoses can be made, and treatment for psychological problems initiated. Play therapy refers to a large number of treatment methods; incorporating reading, coloring, mindfulness, listening to the lyrics that speak to the heart, creating a spoken word, puppets, dolls, games and other options all applying the therapeutic benefits of play. Play therapy differs from regular play in that the therapist helps children engage in play behavior in order to work through their anxieties and resolve their own problems. As a treatment, play therapists use an expressive therapy to change the disturbing behavior, either systematically or in less formal social settings. These techniques can be used by children of all ages from 3 – 103.